MIAMI, Florida - NOAA's National Hurricane Center in Miami, Florida issued a Public Advisory at 5 a.m. on Monday, August 14, 2017, due the presence of Tropical Storm Gert off the coast of Florida. Tropical Storm Gert is located 475 miles west-southwest of Bermuda and is moving toward the north-northwest at 9 mph (15 km/h). A turn toward the north is forecast to occur later this morning, followed by a turn toward the north-northeast by tonight. On the forecast track, Gert is expected to pass about midway between the United States east coast and Bermuda on Tuesday. However, Tropical Storm Gert will likely create hazardous beach conditions and rip currents along the U.S. east coast. 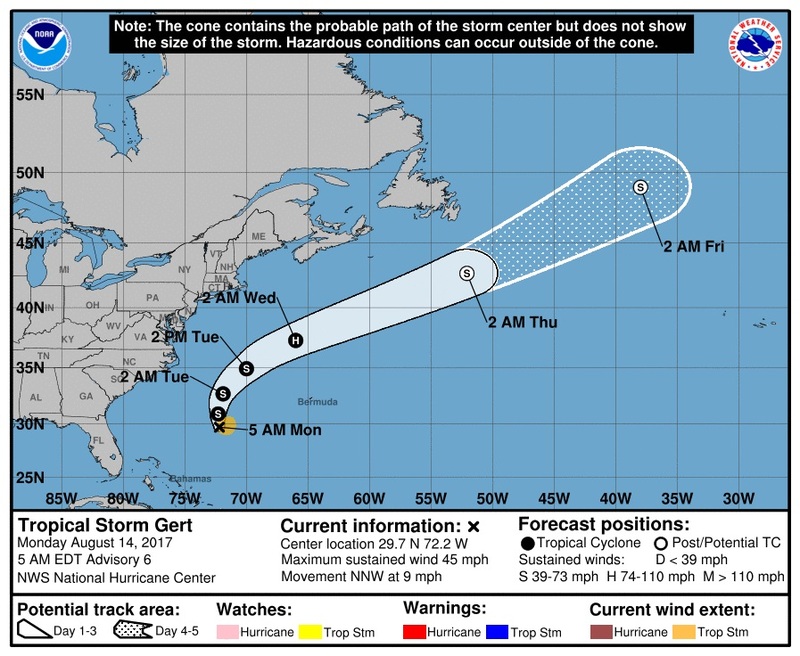 Tropical Storm Gert has maximum sustained winds near 45 mph (75 km/h), with higher gusts. Some strengthening is forecast during the next 48 hours, and Gert could become a hurricane by Wednesday. Tropical-storm-force winds extend outward up to 90 miles (150 km) from the center of the tropical cyclone. NOAA’s Climate Prediction Center forecasts that the 2017 Atlantic hurricane season could be the most active in seven years.